"... contains numerous excellent illustrations, figures and sketches for the effective conception of the information and contains original photographs that exemplify the potency of observation, a prime tool in geological science. Most of the illustrations are in color. The pedagogic value of the book is underlined by exercises throughout the chapters. An accompanying DVD contains the solutions to problems and also animations that make the description of geology much more dynamic and alive. I highly recommend the book as a resource for the basic background of geological knowledge necessary for the understanding of the behaviour of the ground in engineering practice, infrastructure development and environmental protection." "... it provides a comprehensive overview of methods and techniques of this discipline, exploring the nature of the main soils and rocks and their properties." "This book will be useful to all those for whom understanding of the environment that they process is fundamental to make their actions consistent with our future." "This well-written and very didactic work constitutes an excellent synthesis on the role and impact of geology and geological phenomena which affect daily life conditions. It is therefore an excellent reference book and manual for engineers and other specialists dealing with civil engineering, construction and environmental problems, and with issues related to landscape architecture." Geology – Basics for Engineers presents the physical and chemical characteristics of the Earth, the nature and the properties of rocks and unconsolidated deposits/sediments, the action of water, how the earth is transformed by various phenomena at different scales of time and space. The book shows the engineer how to take geological conditions into account in his projects, and how to exploit a wide range of natural resources in an intelligent way, reduce geological hazards, and manage subsurface pollution. Through a problem-based-learning approach, this instructional text imparts knowledge and practical experience to engineering students (undergraduate and graduate level), as well as to experts in the fields of civil engineering, environmental engineering, earth sciences, architecture, land and urban planning. The DVD that supplements the book contains solutions to the problems and animations that show additional facets of the living Earth. *The original French edition of the book (2007) won the prestigious Roberval Prize, an international contest organized by the University of Technology of Compiegne in collaboration with the General Council of Oise, France. 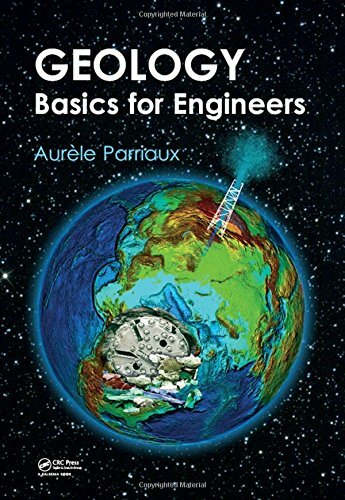 Geology, Basics for Engineers, was selected out of a total of 110 candidates.The jury praised the book as a “very well conceived teaching textbook” and underscored its highly didactic nature, as well as the excellent quality of its illustrations.